Order your own copy of Reign and Reverie at your local retailer or online through our website today! The Midwest Metropolis of ChiLo is as dangerous as it is alluring. With rumors of a clone haven circulating, the city is the perfect place for escaped Nisei-model Akiko to disappear. But her pursuers are never far behind. Jinteki already has a foothold in the city, and no one can stay hidden forever. 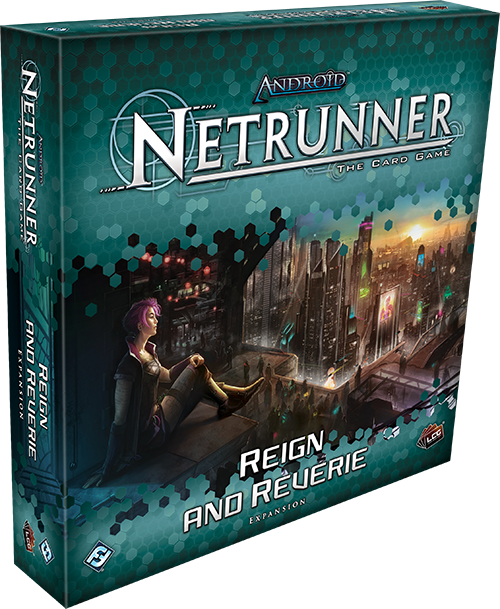 Join us today as we preview the Shaper and Jinteki cards found in Reign and Reverie, the new deluxe expansion for Android Netrunner: The Card Game. Reign and Reverie focuses on the city of ChiLo, and includes new tools for every faction in the game. We have already revealed Akiko Nisei (Reign and Reverie, 15), the Shaper identity included in Reign and Reverie. Today, we get a good look at the cards that will support her endeavors in ChiLo. The most important tool in any runner’s tool kit is a console, and Akiko has one of the best in Mind's Eye (Reign and Reverie, 17). Whenever you make a successful run on R&D, you can place a power counter on Mind’s Eye. During your turn, you may spend a click and remove three hosted power counters to access the top card of R&D. 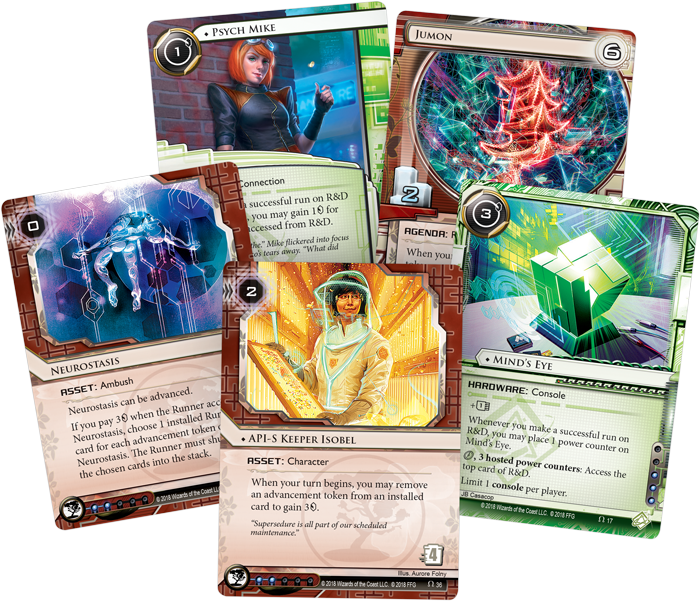 The best cards in Android: Netrunner reward you for taking actions that you want to do anyways, and making runs on R&D is one of those essential goals. A free access is a fantastic bonus, and can potentially become even better with Akiko Nisei, as it activates her ability. Should you successfully play the psi-game, Mind’s Eye can net you two cards off the top of R&D without Akiko ever having to make a run. 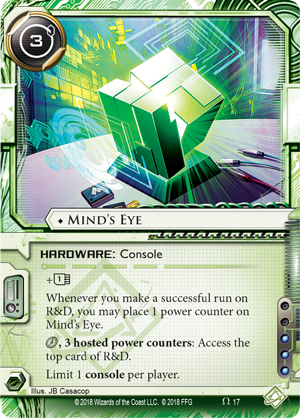 No matter how well R&D is defended, with three power counters on Mind’s Eye, no agenda is safe. Though how can you know the optimal time to fire Mind’s Eye? Luckily, Reign and Reverie gives you a powerful new tool to know exactly what the corp is developing. 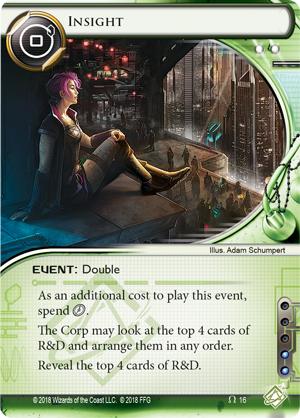 Insight is a double event that lets the corp rearrange the top four cards of R&D… before they reveal those same cards to you. 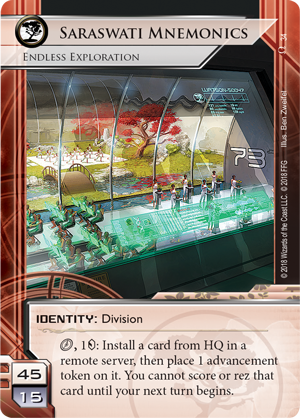 While letting the corp rearrange the top of their deck can seem dangerous, they can’t hide their agendas forever and getting a view of their R&D can let you snipe an agenda with Mind’s Eye. Runners need more than just hardware to be successful. They need connections, to help finance their runs. This is where Psych Mike (Reign and Reverie, 21) comes in handy. 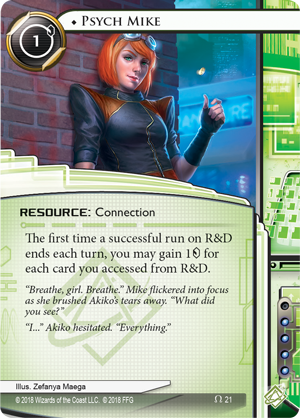 With Mike on the field, the first time a successful run on R&D ends each turn, you can gain one credit for each card that you accessed. 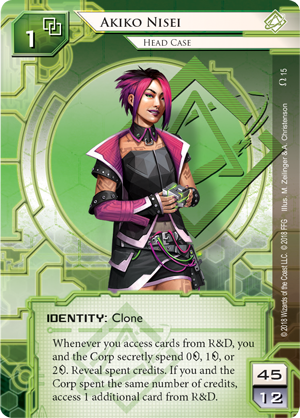 While this can offer an economic boost for any runner, it can also help finance Akiko Nisei’s ability, giving at least one credit back from the psi-game she plays with the corporation. With Pysch Mike watching your back, your credits will never run dry. 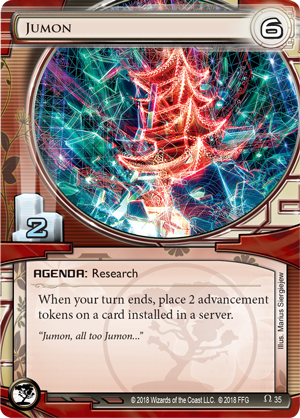 Saraswati Mnemonics (Reign and Reverie, 34) is a terrifying identity that allows you to tap into the cat-and-mouse mind games of Jinteki. 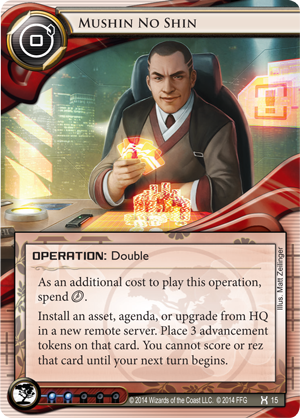 During your turn, this identity lets you spend a click and a credit to install a card from HQ in a remote server and place an advancement token on it. While this is amazing click compression, you are limited in the fact that you cannot score or rez that card until your next turn begins. With cards like Mushin No Shin (Honor and Profit, 15), Jinteki is no stranger to letting their advanced cards sit, ready for the runner to steal. 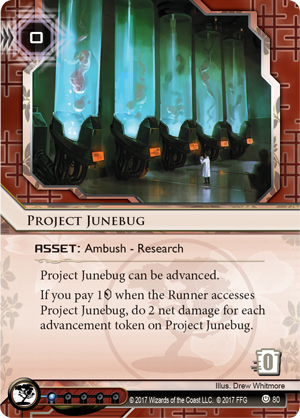 Of course, if the card you choose is something like Project Junebug (Revised Core Set, 80), the runner is in for a nasty surprise. This is the inherent mind game of Jinteki, and something Saraswati Mnemonics excels at. With this division’s ability, you can install a card and have three advancement tokens placed on it in a single turn. Reign and Reverie also introduces the perfect high-cost agenda to try and score with Saraswati Mnemonics. If you dedicate two turns to advancing and scoring Jumon (Reign and Reverie, 35), you will receive a massive advantage. When your turn ends, you may place two advancement tokens on any card installed in a server. 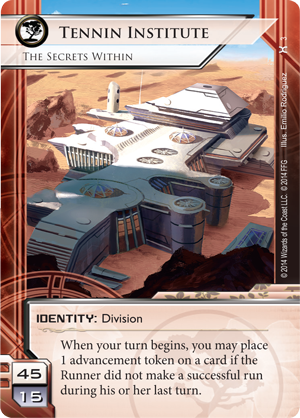 This can greatly accelerate your research into other agendas or set up massive ambushes for the runner. As a passive ability, there's very little risk in advancing a card, as you either try to bait the runner or advance your own hidden agendas. And even if an ambush fizzles, Jinteki still has plenty of uses for advancement tokens. 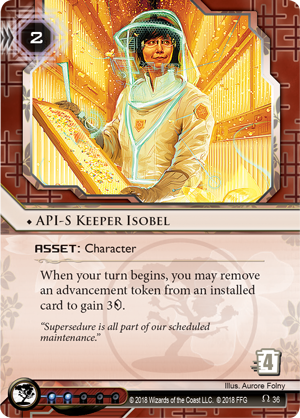 API-S Keeper Isobel (Reign and Reverie, 36) is an asset that can easily be used to keep your credit pool inflated: when your turn begins, you may remove an advancement token from an installed card to gain three credits. API-S Keeper Isobel is a great way to get some use out of an ambush that may not be firing or to make the runner think a card in a server is of no importance to you. API-S Keeper Isobel also synergizes well with the Tennin Institute (Honor and Profit, 3), giving you a use for the advancement tokens you place on installed cards that might not need them. Akiko Nisei tries to find sanctuary in the city of crime, but Jinteki has an established foothold, waiting to ensnare hasty runners in their myriad traps. Who will come out on top? Find out when you pre-order Reign and Reverie (ADN56) from your local retailer or our website today.